And she was an island queen. With an ocean of water between. Of three pence a pound on her tea. “I’ll ne’er do the thing you ax. And packed off a budget of tea. Enough for a large family. She’d half whip her life away. In the dark and boiling tide. This song, like many accounts of the causes of the Revolutionary War, is based on a convenient fiction: That Great Britain in the aftermath of the Seven Years’ War/French and Indian War, was rich, and that government could be had at no cost. In fact the government in England was under severe financial strain after the monumental efforts of the late 1750s and early 1760s. The British economy was staggering — and Britain suddenly had more land to administer and more frontiers to guard. Since it was the American colonies that the British were administering and American frontiers that they were guarding, the British decided to make the Americans share some of the costs. Many sensible Americans, including Benjamin Franklin, accepted the need for this — indeed, the British continued to bear some of the costs themselves, so the Americans were getting government for less than what it cost. But they had been getting government at no cost at all prior to 1763, so they were unhappy (and didn’t believe that they were really getting the benefits of British rule at a cut-rate price). The problem was, the British really blew it with their revenue-raising schemes. They did not consult the colonies, let alone bring Colonials into parliament (which would have been the logical and proper thing to do); they just told the colonies what to do. The result, naturally, was resentment of revenue schemes such as the Stamp Act of 1764 and the Townshend Acts which followed over the next few years. Protests were so loud that the British took the astonishing (for them) step of listening: Most of the revenue acts were repealed. Only one significant one was left: the Tea Act. This was retained for several reasons: To show that the British would not knuckle under completely to their own colonies, to raise a little revenue — and to deal with the problems of the East India Company and excess tea. It was really a very minor tax. 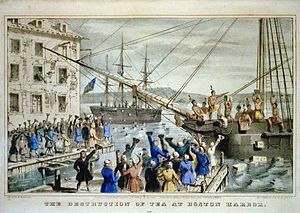 But the colonists had convinced themselves that it was unjust — and so, of course, staged the Boston Tea Party, and the colonies and Britain lurched another step toward the Revolution that neither party wanted. Source: Helene Stratman-Thomas collected a version of this some time in the 1940s from James Merrick Drew of Saint Paul; her version is transcribed on pp. 302-303 of Peters under the pedestrian title “There Was an Old Lady Lived Over the Sea.” That is essentially the version transcribed here, taken from 6/8 to 3/4 and transposed from F down to D. However, there appears to be an error in Peters; it shows the song ending on the second note of the scale (in other words, on E in the above transcription). This neither fits the rest of the song nor matches the other versions of the song I checked, so I have converted that II note to a I, to match the other versions. This song is fairly well-known; it is item A24 in the Laws catalog of American ballads. But it is interesting to find it in Minnesota; most of the version are from the eastern U. S. (Vermont, West Virginia, Florida); strangely enough, there was also a version collected in Toronto by Edith Fowke. I have a copy of this song in “The Golden Book of Favorite Songs” Schmitt, Hall and McCreary Company Minneapolis. Earliest copyright 1915. So I am thinking it is older than the 1940’s. I was trying to find out how old the song was. If you have older dates. I would like to hear about them. Note that the 1940 date is the date of this particular version of the song, not the date of the song’s origin. I would think that the song goes back to the nineteenth century. But the oldest version I can positively date is from 1889 — from Kemp’s Old Folks Concert Tunes. Not an easy item to find…. The Ballad Index entry gives a list of some of the other versions that have been collected; the page for this song is at http://www.fresnostate.edu/folklore/ballads/LA24.html.